Don’t we all have this proverbial yarn-skeleton in our closet? That ball of yarn that isn’t just ever going to fit any project we’ll start. Because it’s simply not you. Right? As my whole family is blessed with boys only and the only girls in my closer circle of friends seem to share my distaste for pink things I was left with the charity-option and will hope these will find someone who appreciates them. As the ball of pinkness in this picture is only one of three I guess you can imagine how many hats I’ll have to make until it’s all used up. Or maybe I’ll come up with another idea. So if you have the same yarn-skeleton in (or under) your stash, please consider knitting for charity. There are millions of options! 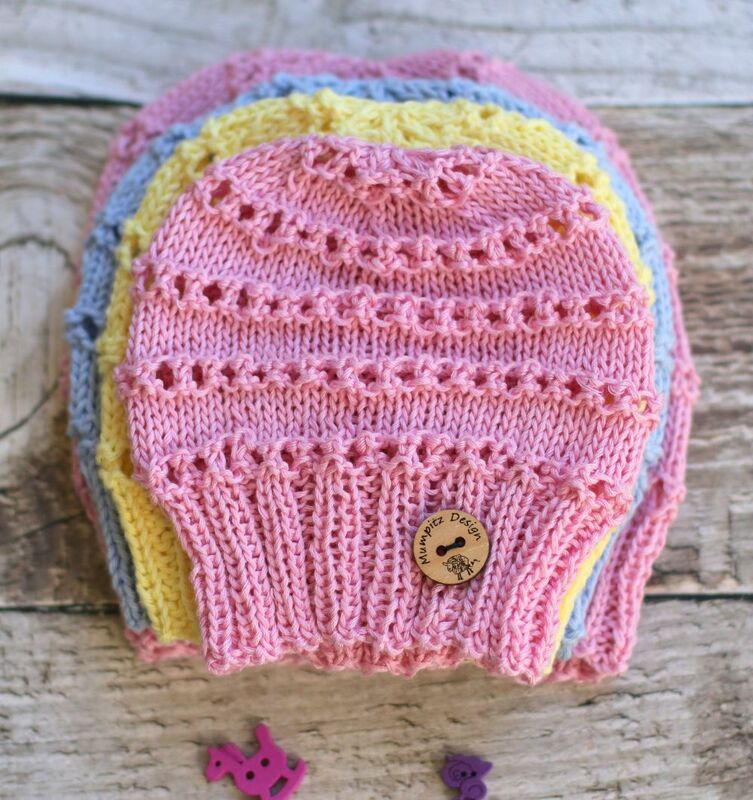 This simple and lovely hat is an adorable addition to the new baby’s wardrobe but will also look great on older children and adults. Knit in cotton or ligther yarns it will be a light summer hat with simple but beautiful eyelets that will knit up in no time. And why not add a crochet (or knit) flower or a Cute-as-a-Button? Whichever you chose it will be lovely, I’m sure! This is not a complete stitch by stitch pattern. Instructions are given for various sizes, it’s really easy to adapt it to your needs. For an adult hat : Approx. 50g (~130yards) DK / 8 ply (11 wpi) yarn in your favorite colour/s, mix and match as you like! Tapestry needle to weave in loose ends. k2tog = Knit two stitches together decreasing 1 stitch. For knitting this hat you’ll need to cast on any even number of stitches. 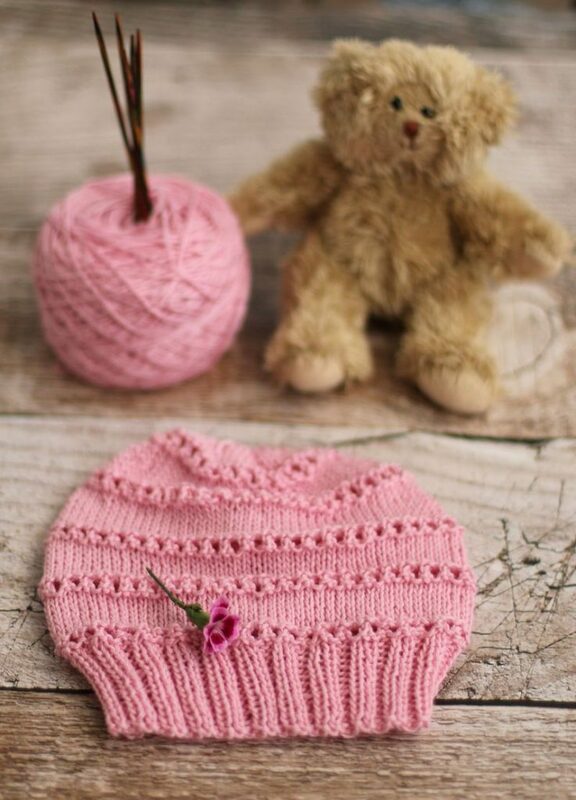 You can easily vary the size of your hat, using thicker/thinner yarn or different sized needles. 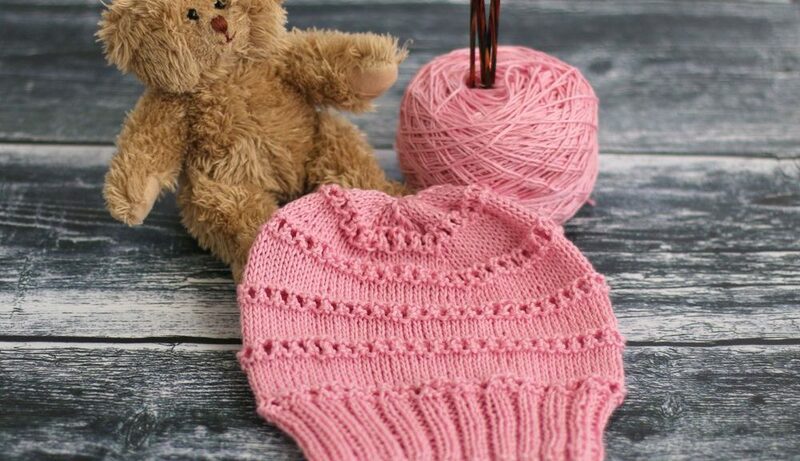 I knit with a very loose tension, so if you are not, please knit a tension check before starting the hat, so that you know how many stitches you’ll need to cast on for your desired size. 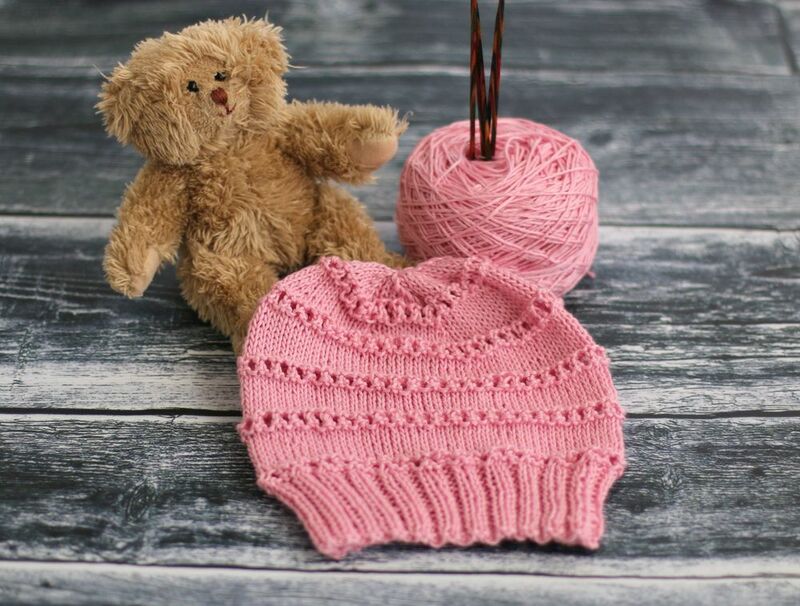 The hat in the pictures is a baby hat (0-6months) and made with Hamburger Wollfabrik Cotton yarn DK / 8 ply (11 wpi) yarn on needles US 4 or 3.5mm. CO your desired number of stitches and join to round without twisting the stitches. Knit in k2, p2 ribbing until the hat measures approximately 4-5cm (1.5-2in) for the brim for a baby hat(more if you are knitting an adult hat). Repeat this block 3 times to a total of four eyelet sections. After this you can start the decrease rounds. Your total amount of st divided by 4, minus 4 st, divided by 2 =? EXAMPLE: I use 80st for my baby hat, divided by 4 = 20 -4 = 16 divided by 2 is 8. So 8 is MY number of stitches I have to knit in between the decreases (k2tog). until finally there are no more st in between the decreases. and so on. Got it? decrease in every round until you have only 8st left. Cut yarn, thread through remaining st and pull tight, weave in ends. 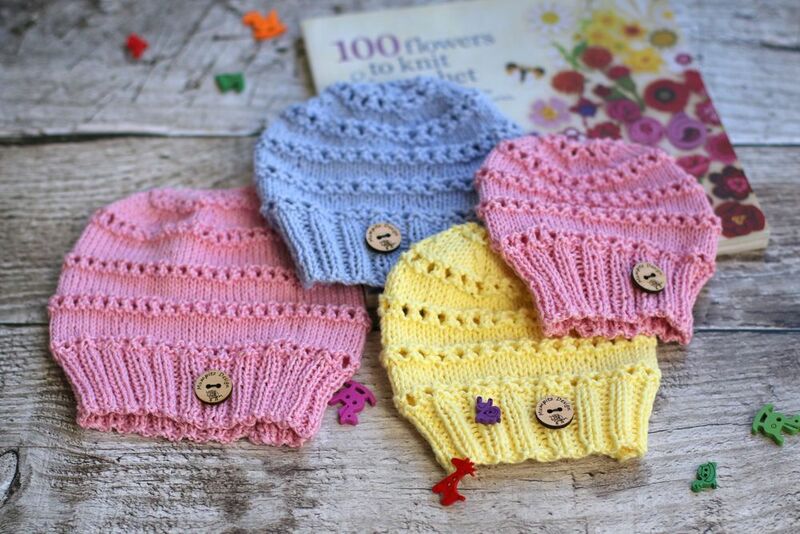 Decorate hat with button, crochet flowers, ribbons or what you like and give to a lucky recipient. And please don’t forget to share your projects with me, I’d love to see them! Give me a shout out on Ravelry, Instagram or Facebook, or wherever you are! You say 4 mil needles -if circular how long should the circular needle be then please and Thankyou. Love the cute pattern. Hi! It depends a little on the size you want to make, but anything from 50cm will do!